The Skukist Wall at Crag Y. Thanks to Mason Irish for the picture. Description: This information has been taken with full and kind permission from a web site created by Larry Hamilton, one of the pioneers of the area. 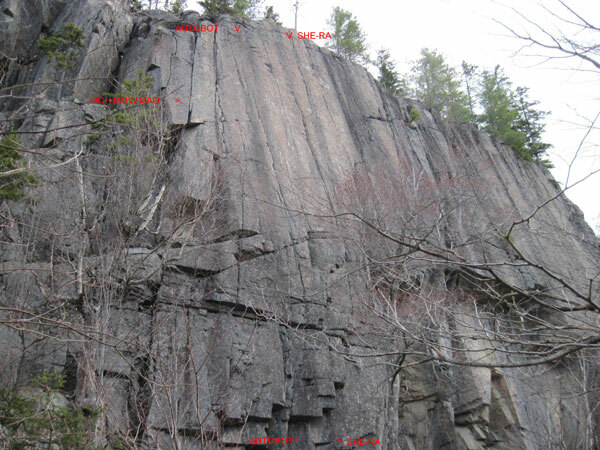 It is an informal guide to Crag Y, a cliff located above the Kancamagus Highway near Little Haystack and South Moat Mountain. Geographically, Crag Y is the northwest extension of the cliff band that forms the south face of Haystack. The rock itself is the same fine-grained syenite found on nearby Sundown and Woodchuck Ledges, with a profusion of thin cracks and dihedrals. Crag Y is small, even by New Hampshire standards; it never reaches a full ropelength in height, and the most interesting section is only a few hundred feet wide. However, despite its limited size and history, Crag Y has a rich concentration of good climbs. The climbing history of this crag is remarkably short. It was "discovered" on May 16, 1987 by Paul (Base) Boissonneault and Jim Ewing, after they had become lost trying to find George Hurley's HYPERSPACE. Crag Y is miles from HYPERSPACE, so the pair were quite lost indeed. When they stumbled upon Crag Y, they found no trace of previous climbing. Since the crag is well hidden from most vantage points, its exact location remained secret through the early summer of 1987. Ewing coined the name "Crag Y," in reaction to other North Conway climbers who were calling their own secret finds "Crag X." Over succeeding weeks, the secret of Crag Y spread gradually to a wider circle of climbers. It testifies to the crag's quality that many in this circle returned repeatedly, despite the long, humid approach, to work out new routes during the height of bug season. There was a sense of conspiracy about this work, as other climbers pried for information about the mysterious new crag. The conspiracy was not very quiet, though. Even during this "secret" phase of development, there were occasionally four parties on the cliff at once. Within two months about 25 routes had been established, and several Last Great Problems were under siege. For some reason many routes got named after Saturday morning cartoon shows. The crag's early history was a period of extensive gardening and reconnaissance. This activity focused particularly on the left and central parts of the cliff, which were initially rather vegetated and dirty. Determined efforts by many individuals went into uncovering the clean crack lines that now characterize these sections. Boulder-trundling was for several months a popular Sunday-afternoon sport at Crag Y. To the right of the central wall, a more "mountaineering" attitude prevailed. Hurley's routes in the Recess, and all of the routes right of DECEPTICON, are among those climbed entirely on sight. Carry some traditional gear including small wires and camming units for all climbs on Crag Y. The routes are not visited often, so be prepared for possible surprises. Most of these routes were established during the spring and summer of 1987. Locally, that was a transitional period between the wired-nut ethics of the 1970s and 80s, and the rap-bolting spirit of the 90s. Crag Y routes were established in a variety of styles from pure traditionalism to rap-cleaning and pre-protection. Even the more "radical" climbers had not yet embraced the full concept of sport climbing, however, and the protection they placed was often a piton. If experienced future parties agree that fixed pro is still justified where Crag Y first ascentionists left pitons, they should feel free to remove those pitons and replace them one for one with more durable bolts. On the other hand, where the original climbers ran it out or used "clean" pro (whatever its quality), leave the route as it is. Directions: The surest way to find Crag Y is to go with someone who has been there before. The forested slopes around the crag are almost featureless, so it is easy even for return visitors to discover that they are accidentally climbing Moat Mountain instead. I hope to have a GPS track available in the near future. If you don't get lost, the approach takes about 45 minutes. Begin on an old logging road, off Dugway Road between Woodchuck and Sundown Ledges. The logging road starts 1.8 miles west of the Dugway picnic grounds, or 1.2 miles east of the covered bridge. Hike west on this road until you cross Big Brook, a sizable stream. Continue about two hundred yards farther, to a point just before the logging road takes a sharp left turn and begins to climb. Head into the woods on the right here, quickly joining Big Brook. Walk alongside the brook a short distance until a huge mossy boulder, almost house-sized, can be dimly seen on its east bank. Cross to the east bank at this boulder. A smaller stream descends the hillside from the east here, joining Big Brook beside the huge boulder. Begin hiking uphill along the right side of this small stream. Follow this streambed all the way to its head, choosing the wider branch every time it forks. From the stream-head, a faint trail continues up into the small valley which separates the crag (visible on your left) from the back side of Woodchuck (a.k.a. Eagle Cliff). It is easy to miss this valley, and end up either too far left, climbing Moat Mountain, or too far right, on the slopes of Eagle Cliff. With some thrashing, you can still reach the crag by traversing in the appropriate direction. If you find yourself on volcanic bedrock, you are likely too far left. Left Side -- broken by ledges, but with several clean cracks and dihedrals on the upper half. Sunkist Wall -- the crag's steep central section, rising above the approach trail. This section is named for the sunny orange slab, seamed by a dozen or so perfect cracks, on which all the routes finish. Recess -- right of the Sunkist Wall area a small talus field descends from a recess, bounded by dihedrals on its left and right sides. Decepticon Buttress -- forms the right boundary of the Recess; not really a buttress, but it looks like one when approached from the left. Red Walls -- obviously-named section of steep water-stained slabs and ledges, below and right of Decepticon Buttress. Far Right -- to the right of the Red Walls the rock goes on and on, though it is nowhere very impressive.